It’s a simple fact born out of dozens of films: Jason Statham loves kicking stuff. Whether it’s people, doors, bikes, dogs, walls, anything—the man just gets a real delight out of kicking various things in his films. Oh sure, he’s really into punching things and people too. But his heart? His heart is with the kicking. And so Burger Fiction has pored over Statham’s filmography to find all the instances of the British action star delivering blows with his legs. 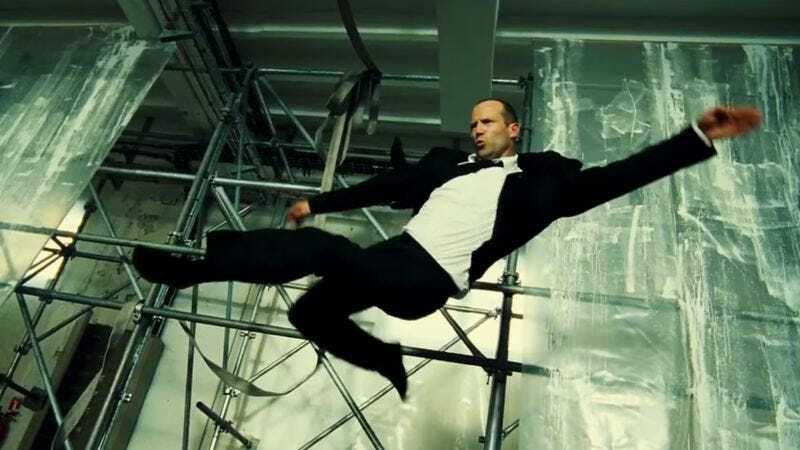 While the world awaits more Statham kicking in the soon-to-be-released Mechanic: Resurrection, this supercut of every kick should tide folks over until Friday. There’s the spinning kick, the jumping kick, the “kick the dude on the ground” staple, and a whole host of other moves in his kicking arsenal. Statham may not be the most versatile of actors, but his variety of kicks to people and objects knows no bounds and no equal. He may not hold other action films in high regard, but perhaps that’s just because they don’t feature enough kicking for this particular actor to stay focused. If the kick count is to be believed, the man has delivered 394 kicks in his career. That’s got to count for something, doesn’t it?